Here's a 10 minute vidoc from 343 Industries that delves a little bit deeper into the Foreunner mythology and class of Foreunner known as the Prometheans that will be the antagonists of the Halo 4 game. Featuring usual suspects like Kiki Wolfkill, Josh Holmes, Brian Reed and of course Frankie, the vidoc explains about Foreunner design considerations and the challenge of making the presence of Forerunners fit as being active participators in a Halo campaign. The vidoc also shows some of the flash new Forerunner weapons in action - the bolt pistol looks pretty cool! As I hadn't noticed it before (despite the above picture!) the vidoc points out how the Prometheans have parts that appear to be floating, rather than attached to their giant frames. This video leaves me in no doubt that Halo 4 is going to be the best game of the series. Some of the game play and vistas shown is totally amazing. The campaign has a high quality look about it. I wonder if there will be a 'Bob' class of Forerunner and if so what should his name be? I propose Jack. Bungie hated Halo Wars. No surprise there then. Is your copy of Halo signed by Bill Gates? Spartans go on a date? 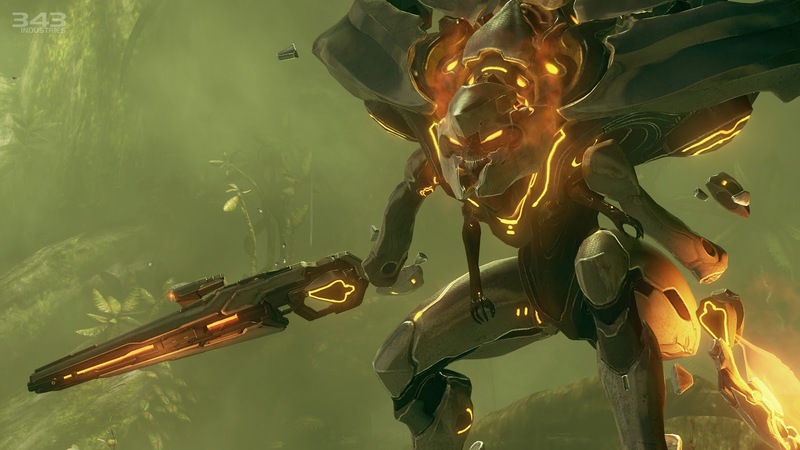 Are there Hunters in Halo 4? Halo 4 Flood Mode: Quelle Horreur! CTF rules for Halo 4, the medals on offer!